The Jewish Chronicle has apologised to readers who complained after it ran an advert for the Disasters Emergency Committee's Gaza crisis appeal. There is currently a five-day ceasefire between Israel and the Palestinians. The Israelis launched a military operation on 8 July to stop militant attacks from Gaza. After a DEC advert featured in this week's Jewish Chronicle (JC), a Facebook page was set up calling on readers to boycott the title until it issued a "full apology". "We have nothing against giving aid to people caught up in a conflict" it said, but accused the Hamas rulers of Gaza of using aid in a campaign of violence against Israel. A message posted on the paper's own Facebook page pointed out that the advert was "not an expression of the JC's view". Meanwhile, Israel's embassy in the UK issued a statement in which it said its own concern about the DEC appeal "stems from the fact that the list of charities on the DEC includes Islamic Relief Worldwide, which has been designated in Israel recently as an unlawful association, for providing support and funnelling funds to Hamas, a terror group designated in the UK. "Surely this must raise cause for concern for the public donating money for children, when one of the donors has been officially declared to be using that money to support a recognized terror group," it said. In response, Islamic Relief Worldwide said it "categorically denies any links with Hamas". It added: "Islamic Relief Worldwide is regulated in the UK by the Charity Commission and has rigorous internal control and compliance systems in place to ensure we uphold our humanitarian principles of impartiality, independence and neutrality." About 2,000 people have died in Gaza since the fighting began last month. Those killed include more than 1,900 Palestinians, mostly civilians, according to the United Nations. Sixty-four Israeli soldiers have been killed in the violence and three civilians in Israel have also died. The DEC, an umbrella organisation which brings together 13 UK aid charities to deal with international crises, launched its campaign on 7 August. It said one and a half million people had "no or very limited" water or sanitation, with many in "urgent need of medical care". 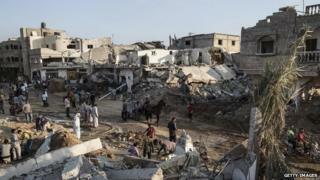 The BBC and other public service broadcasters agreed to air a DEC Gaza appeal. In 2009, the BBC and Sky chose not to broadcast a previous Gaza appeal, with the BBC's decision prompting angry protests and 40,000 complaints.